As a crochet-addict and mother of three, I am constantly trying to find ways to get my kids crocheting. The Chain Stitch Christmas Garland was perfect for us! 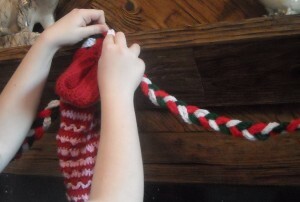 This project is a great way to use the kids’ Christmas season excitement to teach them a few crocheting fundamentals. The garland is worked entirely in the crochet chain stitch, and the end result is a colorful, braided garland to hang on your tree, mantle piece, or anywhere else you wish. My kids chose to hand there’s on the cat; but that’s another story. The first step in teaching a child to crochet is the chain stitch. The chain stitch is just that initial “yarn-over, pull through” that you work as you chain the required number of stitches to begin most projects. Children can learn this stitch rather easily. While many preschoolers and kindergarteners are not yet ready to chain stitch, first graders and up can begin to learn this stitch, either with or without a hook. There is no set age to begin crocheting, it all depends on the child’s hand and eye coordination and finger dexterity. My nine-year-old can easily complete a long chain of crocheted chain stitches and can work a few other stitches as well. My six-year-old, however, is not quite ready to work with a hook, but can make long chain stitch chains with her fingers. My four-year-old daughter is not ready to crochet the chain stitch but can help when we get to the braiding step. The first step is to pick your yarn colors for your garland. Any colors will do, but we chose Red Heart Super Saver in Paddy Green, White, and Cherry Red. Second, you and the kids chain, chain , chain! Make chains as long as you like. Mix colors or chain only in one color. Either way, you will end up with a nice garland. Third, take your chains and braid them together. Or, you can hold chains together and tie them in knots periodically to make a looser garland that drapes nicely. Experiment! There is no wrong way to do this! The most important thing is to just have fun with your little darlings. Remember, this project is not just for kids. Parents, grandparents, and fur-baby parents will enjoy it as well. This project is great for all ages and all homes. For our garland, we made three white, three green, and three red chains. 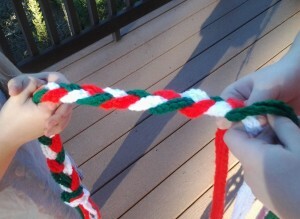 Then, holding the colors together, we braided them into one large garland that we hung on the fireplace. 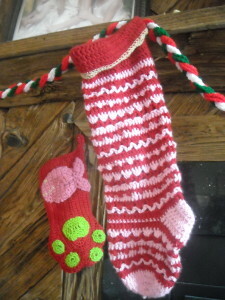 They look really colorful and fun hanging next to our crocheted Christmas stockings! What Christmas items have you crocheted for your home? This entry was posted on Tuesday, December 8th, 2015 at 12:00 AM by Molly Ferriter	and is filed under Tutorials and Help. You can follow any responses to this entry through the RSS 2.0 feed. You can skip to the end and leave a response. Pinging is currently not allowed. I’ve made short version of these to tie my kitchen cabinets shut- childproofing with yarn! LOL! That is a great way to childproof the cabinets- unless your little one is a Houdini and can untie them at an early age! I’m glad mine are old enough that I don’t have to child proof the cabinets anymore. We can find so many uses for our yarn! I made one in a circle and hung it on my front door. People are asking where I purchased it. I give them your website. Katherine, what a great idea! It could be crocheted in other colors for other holidays: red, white, and blue for the 4th of July, red, pink, and white for Valentine’s Day. Thanks so much for sharing this. I love it when someone shares what they have made from an idea in one of my posts! I bet you will inspire others to try this as well!.